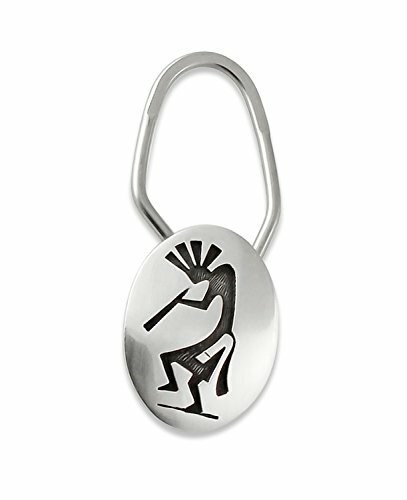 This Sterling Silver Hopi key chain is very traditional in shape, design, and technique. The technique used by Hopi artists utilizes two sheets of silver, laid one on top of the other. First the bottom sheet is etched and oxidized. Then the top layer is precision hand cut and soldered to the first sheet together. It is then buffed and finished. This key chain is not only fashionable but has practical use as well! Manufacturer: Mesa Verde Traders Inc. Brand: Mesa Verde Traders Inc. Publisher: Mesa Verde Traders Inc. Studio: Mesa Verde Traders Inc. If you have any questions about this product by Mesa Verde Traders Inc., contact us by completing and submitting the form below. If you are looking for a specif part number, please include it with your message.